Kingsmill Barns Bed and Breakfast is contained within a 16th century converted barn on the River Test. 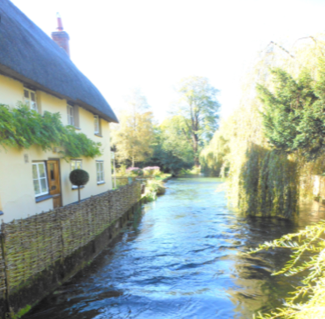 Wherwell is an historic and picturesque thatched village, deep in the heart of rural Hampshire and the beautiful Test Valley. It is conveniently situated close to many major historic towns and cities, and offers access to many places of interest, the countryside, fishing and field sports. ​The beautiful town of Stockbridge is a 7 minute drive, offering plenty of individual shops as well as excellent eateries and bars. Winchester is 15 minutes by car. ​The White Lion pub is a half minute walk away and serves lunch and dinner. ​Click here to find out more about Wherwell. Kingsmill Barns Bed and Breakfast offers private access to a luxury suite comprising lounge, bedroom and shower room. You can also enjoy your own patio area plus the use of a garden on the banks of the River Test.